Underwater photographers are predominantly subject to Murphy's (Sod's) Law - What can go wrong will go wrong; this is bad enough over a two-week trip but when you take several weeks away from a repair-facility things inevitably get worse. The only way around this is multiple redundancy (backup). I set off on most of my trips with three Nikon land cameras; two Nikonos underwater cameras; two Subal aluminium underwater housings; three Sea & Sea and one Subtronic underwater flash guns, two Nikon land flash guns and a Subal aluminium housing for taking these underwater. Add a laptop computer, various lenses, base plates, strobe arms, spare synchronization cables, chargers, batteries and battery packs to cover regular power failures, underwater torches, film and diving equipment and I have to arrange for extra checked baggage plus over 20 kilograms of hand baggage with an airline. Dolphin and diver, Nikonos V, 15mm lens 1/90 at F5.6. Scalloped Hammerhead Shark, Nikonos V, 28mm lens 1/90 at F8. an emergency. For the same reason I always dive with two different dive computers, one of which has user replaceable batteries. 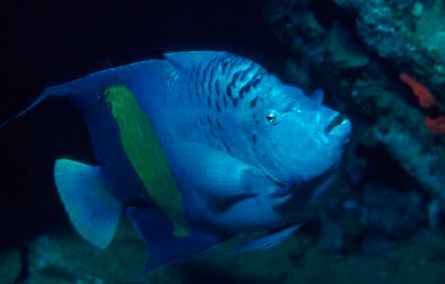 I have only found two countries where local law prohibits me from diving alone -Aruba and Israel. The tourist board supplied me with a buddy in Aruba and the operators in Israel, they must have been bored but at least they were useful for carrying extra cameras. Muck diving is a different situation where I am grateful for a dive guide's local knowledge saving me time by knowing where the tiny critters can be found. In rare cases, whoever commissions the trip cannot organize a suitable arrangement with their usual airline to cover journalists' baggage. In these instances I may have to find a more accommodating airline or if the destination can be reached via the United States of America I will go that way with an American airline as these treat checked baggage by size rather than weight. Carrying all of this equipment can also be a problem, on land I sometimes have to engage porters and once had to resort to a wheelbarrow to travel several miles along a beach. I always keep the film separate so that it is never left in the sun. 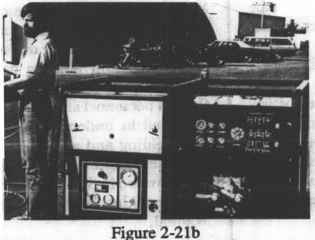 I have had slow film ruined by airport X-rays and on a longer trip my film can pass through 20--30 X-ray machines so I ask for hand searches wherever possible. Lead-lined bags are no longer a good protection, once when I passed through Sharm el Sheikh airport with film in lead-lined bags, the machine operator just turned up the scanning strength and we could clearly see every film on the monitor. 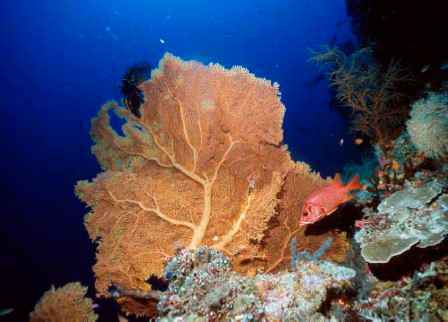 Gorgonian Sea Fan, Nikon F90x, 14mm Sigma rectilinear lens, 1/125 at F5.6. none on the islands and several cases where I had to arrange refills of diving cylinders en route or carry a compressor on small boats. Local customs and politics are not always straightforward. I do not bother with photographic-carnets but do have to carry a customs list with values. Grey Reef Shark against sun, Nikonos V, 15mm lens 1/90 at F8. Yellowbar Angelfish, Nikon F801s, 55mm Micro-Nikkor lens, 1/125 at F8. interpreters, as we had to ask for separate permission to dive from the headman on each of the islands. Each island often had a distinct tribal-group and language and some had not seen foreigners since the Japanese occupation during World War II. We found a number of good dives and a recently salvaged Chinese junk with Ming Porcelain but all of my research came to nothing when the Sipadan hostages were held at the main Island of Jolo two weeks later. On the downside, when it came to departure time, I was the only client to leave so I had a wet journey in a small open speedboat across Taytay Bay to the mainland, not a good way to travel when you have to catch a plane to Manila and an onward connecting flight. Fortunately I was the only passenger on the 19-seat aircraft to Manila so my being wet did not annoy anyone else. On a repeat visit to Coron, I had a pleasant time diving on the wrecks and we spent one night bivouacking on a tiny island where the weather looked a bit dodgy. Expecting possible weather problems, I took all my cameras ashore including two housed cameras that were already connected with synchronization cables to flash guns. On the first dive the next day one of my flash guns began firing off continuously like a strobe light. I struggled with this unit for several days, double checking all connections and fitting the housing with twin-flash, it worked fine in air but every time I took it into the water it malfunctioned. Eventually I spotted the tiny impression of a rat's teeth on the synchronization cable, £70 of synchronization cable and several dives destroyed by a hungry rodent! Animals often take a liking to the odour of silicone rubber, on a Malaysian island I once found squirrels eating my guide's silicone rubber mask. From Coron the weather prevented us from getting north to Club Paradise on Dimakya Island by banca (Small outrigger boat) so we returned to Coron and travelled overland to Maricaban Bay. Arriving there at nightfall we managed to get a local banca to Maricaban Bay Resort but it was closed with generator problems. Fortunately one of the directors of Club Paradise passed by with a larger banca heading for Dimakya Island so we jumped aboard. The crossing to Club Paradise was very rough, the coxswain only understood two speeds -full speed ahead and stop; he did not understand how a boat should be manoeuvred to comfortably ride high waves. The result of crashing and banging over the waves was wet passengers and one of my battery chargers broken. 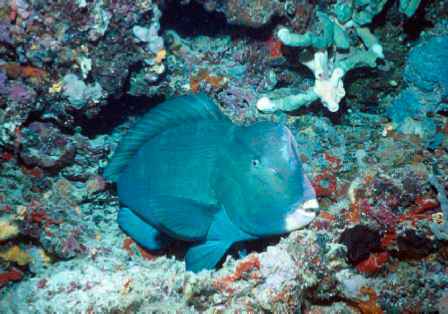 Dimakya Island does not have sheltered anchorage and for ecological reasons Club Paradise do not wish to build one. The weather had been rough for several days and when we arrived, the banca hove to about 50m offshore while we transferred our equipment and ourselves from a bouncing banca to an even more bouncing small open speedboat in a 2-metre swell. Disorientated in the dark I was certain that we would end up with a capsized speedboat when crossing the surf but the staff at Club Paradise had obviously encountered this situation before. The coxswain gunned the outboard motor and drove the speedboat full-speed at the beach where, as we hit the beach, 30 or more male figures appeared all around us, physically lifted the boat and carried it up the beach, what a welcome! When we came to leave Dimakya Island we had a tricky time boarding the banca by its gangplank in the swell and the light-aircraft that we were booked on from Busuanga had crashed with no survivors so we had to find another. When we did find another aircraft, the airline took advantage of situation and charged the earth for my excess baggage. While landing at the marine reserve of Apo Island in the Philippines, I stepped off the banca into the water in my usual bare feet and trod on some broken glass - resulting in a deep 5-inch cut across the sole of my foot. Nasty cuts never heal unless you spend several days out of the water but photojournalist have a job to do and limited time to do it in, I had to continue diving with it for the next two weeks. I once had a similar problem when diving off a fishing boat in the Sudanese Red Sea where I shredded my hand on the barnacles covering its bottom. This time I was able to continue diving by wearing a rubber glove full of Dettol disinfectant while in the water. 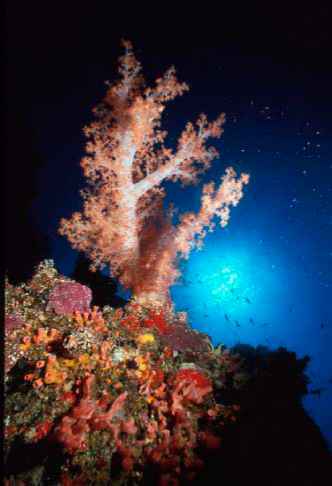 Soft Tree Coral against sun, Nikon F90x, 14mm Sigma rectilinear lens, 1/125 at F11. guide had remarked that the new bamboo jetty that had recently been constructed for visiting politicians would not last long but never expected that we would be the ones to prove him right, it collapsed as we crossed onto land and we had to swim back to the banca - in my case, holding a land camera and film above my head to keep it dry. I once travelled back from Leyte to Cebu on a modern SuperCat catamaran ferry through a storm that made most of the passengers seasick and sank another ferry with great loss of life in the same area. I immediately transferred to Manila, Singapore and London but rough weather followed me home. London was suffering such a bad storm that the plane had trouble landing but it was the taxi driver who had the last laugh, being late on Christmas Eve he was legally able to charge me four times the normal rate! Babs Jackson on the Umbria, Nikonos V, 15mm lens 1/90 at F5.6. three-metre plus Silky and Silvertip sharks, there is always the chance that one of them will have a sore head on the day. In the Sudan one of my worst experiences was when a large battle-scarred male Silky shark attacked every one of us, we decided that discretion was better than valour and got out of the water. 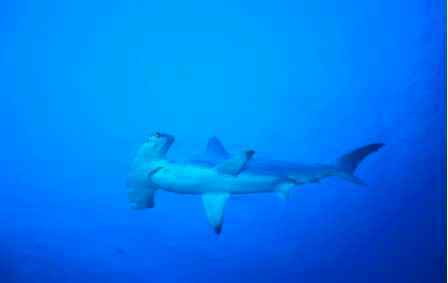 Hammerhead Sharks do not respond to feeding but some do venture fairly close anyway. Throughout the 70s and 80s, large shoals of Scalloped Hammerheads were common at Sanganeb and I was pleased to find that squadrons of over 100 of them were back in July 2002. The depth is such that still pictures are only shadows but the video people get great footage. Light-coloured fins are a problem, larger fish think that they are separate, edible-sized small fish, I have had such fins nibbled by both sharks and large groupers. For many months, the aftermath of September 11, 2001 was horrendous. Airlines, hotels and resorts ceased trading, many airlines would not carry electrical goods and some airlines would not accept any hand baggage in the cabin, even film; I had to cancel several trips. Diving photojournalism sounds glamorous but is not always so; You get to stay at the best resorts and hotels but more often than not you arrive late at night and depart early in the morning so you rarely have time to sample what is on offer other than the diving. Most hotels and all live-aboard boats have dim lighting that make it difficult to put intricate underwater camera equipment together and to write up the dives; often the bathroom is the only place that is reasonably lit so I spend a lot of time in there. Non-standard electricity supplies, power failures and resorts or live-aboard boats with erratic generators, often produce power surges, which despite special voltage regulators, blow battery chargers and other electrical equipment. Bad weather or malfunctioning equipment is no excuse for not producing suitable photographs, I had seven weeks of rain in Aruba, Bonaire and Curaçao but I am paid to return with results. Despite all these problems, I do it because I enjoy it and fully appreciate the help I get from local people. Nowadays I use Fuji Provia 100 or Velvia and always use manual mode at 1/125 or 1/250 of a second with centre-weighted metering on housed cameras and 1/90 of a second with the Nikonos V. I use single flash for wide-angle shots but twin-flash for macro. When using twin-flash, one flash is at least twice as powerful as the other to give modelling-light, this avoids flat pictures. Most problems can be foreseen but not all. The moral is to cut out the water column, use 1/125 or 1/250-second at F5.6 or f4 and above all, be there.